Most people get into smartwatches because they want a lightweight music device for running or the gym. If you don’t want a smart brick in your pocket when you’re working up a sweat, a smartwatch for music is what you want. With a smartwatch and a pair of Bluetooth headphones, you have the ease of convenience to skip tracks from your wrist. Not into fitness? No problem. However, you do commute, right? Or at the very least, you walk places and enjoy a good tune. If that’s the case, a smartwatch will untether you from your smartphone and bring everything you love to your wrist. Your favourite music apps, all your killer playlists and everything will be right there and ready to go. The must-have criterion for the best smartwatches for music is that every device has to have over 4GB of on-board storage for your music and access to a wide range of music apps. Wear OS (previously Android Wear) smartwatches are standalone devices with their own version of the Google Play app store. This means that with them, you have access to Google Play Music, YouTube Music, SoundCloud, Deezer, and a wide range of other quality third-party music apps - even more so than what you get with an Apple Watch! For this reason, the best smartwatches for music are also the best Wear OS smartwatches. Keep this in mind when you’re out shopping. With Wi-Fi and LTE connectivity for streaming music online, 4GB of onboard storage for your offline playlists and Bluetooth 4.2 LE for seamless headphone pairing, the LG Watch Sport is effortlessly one of the best music smartwatches on the market. It’s also packed with top features. The 1.38” 480 x 480 P-OLED display is the best you have ever seen on a Wear OS smartwatch because it’s super-bright and responsive. Battery life is decent too. Go for a run at 100%, and the 430 mAh battery will drain to around 91% after an hour with Bluetooth turned on. Now that’s decent. It’s available with 4G LTE which makes it a doubly good deal for music. It runs Wear OS, so you can grab the Google Play Music app and download your playlists. Bluetooth 4.1 LE takes care of headphone pairing (4.1 is slightly slower than 4.2), but that’s only a minor criticism. Everywhere else, the Huawei Watch 2 delivers. The 390 x 390 AMOLED display is bright and crisp, there’s GPS, NFC, and a heart rate monitor and there’s 4GB onboard storage. Everything you need in your new smartwatch. With LTE connectivity, Wi-Fi, Bluetooth 4.0 and a Massive 16GB built-in storage, the Zeblaze Thor 4 is the best smartwatch for music you’ve never heard of. It runs Android 7.0, instead of Wear OS, allowing Zeblaze to customise the user experience. It supports thousands of Google Play Store apps, including YouTube Music and Google Play Music, as well as a host of radio stations for online streaming. And that user experience is appreciable. The software is lightweight and slick, and the Thor 4 has an AMOLED 400 x 400 display with 336 PPI to view it on. If you have an iPhone, the best music smartwatch for you regarding functionality is the Apple Watch Series 3. You’ll find the OS much more comfortable, and the Series 3 will sync with your iPhone to deliver a full suite of notifications. For your music, there’s 4GB onboard storage and cellular connectivity (LTE), so you can stream music from your favourite apps such as Apple Watch Music or Radio app, or with Pandora Radio and TuneIn radio. As well as a new SoundHound app has also recently launched with a great interface. Although being two years in age, the LG Watch Urbane can stand strong amongst the rest. It’s got LTE connectivity and runs Android Wear 2.0. The 1.38” P-OLED display is bright and crisp, and there’s 4GB onboard storage (2.5GB usable) for storing your music. The brushed aluminium case is upmarket, and the rubber strap is extremely tough. There are three physical buttons on the side of the case so you can quickly control apps and switch between different functions. You can store music on the watch or stream smartphone-free. It’s entirely up to you. 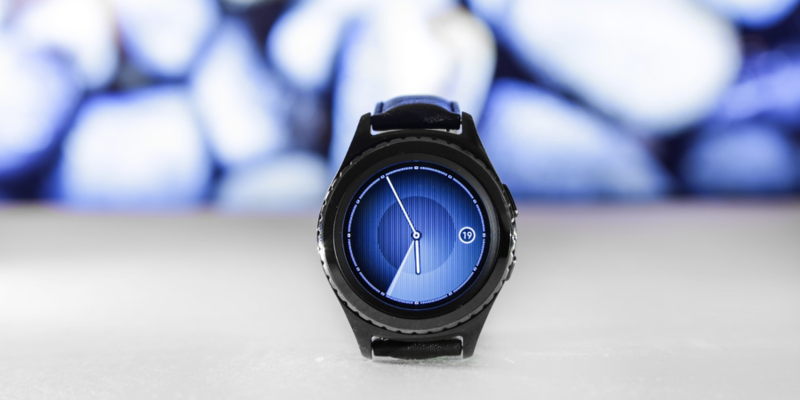 The Samsung Gear S3 Frontier is another top-tier smartwatch. There’s 4GB onboard storage, Bluetooth 4.2 for seamless headphone pairing and of course, 4G LTE connectivity so you can stream music online untethered from your smartphone. The critical difference between this and the LG is the Gear S3 runs Tizen, Samsung’s OS. This limits the music apps available, although there’s an excellent official Spotify app. If you can look past the lack of apps (or you use Spotify anyway), the Gear S3 Frontier has a top display, excellent battery life and a rotating bezel. If you’ll be using your smartwatch as a gym or running companion, the Garmin Vivoactive 3 Music is an excellent choice. It offers storage for up to 500 songs, and you can easily transfer music over from your computer using the Garmin Express app. The watch has a music player built in, and if you want to download something new you can from AWA Music, KKBOX and iHeartRadio. If you have playlists you can download, the Garmin Vivoactive 3 Music is appropriate, and it’s an excellent fitness smartwatch. It’ll track everything down to a tee. It’s got GPS, a barometric altimeter, compass, accelerometer, thermometer and heart rate sensor. The Huawei Watch 2 Sport has 4GB onboard storage, built-in GPS and a gorgeous, virtually scratch-proof ceramic bezel. It looks the part and plays it too, with the latest-gen Snapdragon Wear 2100 processor and a 390 x 390 AMOLED display. It’s brilliant for music because it’s got Bluetooth 4.1, a decent amount of onboard storage and an IP68 water resistance rating - which is great if you run! It only has Wi-F, but if you download your playlists, for example with Google Play Music, you can stream music to your Bluetooth headphones without a connection. The latest (and most expensive) Ticwatch is the best yet. The Ticwatch Pro is a fantastic smartwatch for music. It doesn’t have LTE, but it hits back with a stonking 3-day average battery life and 4GB onboard storage. It comes with a heart-rate monitor and inbuilt GPS. The headphone pairing process is painless, and because it runs Wear OS, you get access to hundreds of exciting music apps. The real draw of this smartwatch is the dual screen. It has both a basic LCD panel and an OLED display to extend battery life. You could get up to 5 days on a single charge. The polar M600 is actually the best for fitness. The Polar M600 is a Wear OS smartwatch that’s waterproof with GPS and GLONASS connectivity. Listen to music while you train using Google Play Music - all you have to do is download your playlists over Wi-Fi. The M600’s smart coaching is the best in the business. It provides insight into your workouts automatically and crunches data to help you understand your fitness. Additional features include a heart rate tracker and 24/7 activity tracking. This smartwatch will also track altitude, ascent and descent. With each smartphone boasting the ability to give the soundtrack you need, with additionally great features attached; you will be running on time every TIME! iTouch is one of the few messaging companies in Africa that abide by GDPR and POPI security standards. If you need assistance in building effective messaging solutions for your business, contact us to see how we can help.